1) First part your hair down the middle. We are going to do three small braids on each side of your head. Secure off one side with a clip and take a small section of hair from your forehead. 2) Braid about half way down. You don't want to go all the way to the bottom, because we are going to braid the bottom section--doing this will make the top braids look like they "meld" with the bottom braids. 3) I used hair pins to secure the bottoms of these small braids because we won't be leaving any pins or bands in. Take another small piece of hair right next to the braid you just made and make another braid about half way down. Then do this a third time, until you have three small braids that start at the top of your head and go halfway the length of your hair. 3. Now, secure your hair with your favorite color of hair band. I used black, because it matched my outfit. Remove the bobby pins, and part this ponytail into two sections. 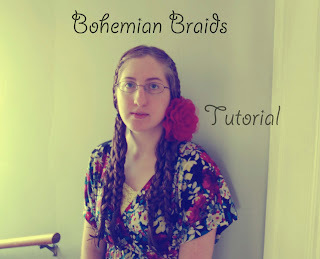 4) You want to braid each section of hair, and secure with small bands. Quick edit--the next day when I shook my boho braids loose after sleeping on them, my hair was super super curly!